This is a pie and a half, with a rich, indulgent chocolate filling and a sticky marshmallow topping. Grease a 20cm springform cake tin with sunflower oil and line the base and sides with non-stick baking paper. Snap the chocolates into a small heatproof bowl and either melt in the microwave in 30-second blasts, stirring between each go, or set over a pan of simmering water, shallow enough that the water doesn’t touch the bowl. Once melted, leave aside to cool until needed. Melt the butter in a medium saucepan on the hob or in a bowl in the microwave. Blend the biscuits in a food processor or seal in a ziplock bag and bash with a rolling pin to fine crumbs. Stir into the melted butter to coat evenly and press onto the base of the tin and about 4cm up the sides. Chill for 15 minutes to firm up. Briefly beat the cream cheese in a large bowl. Beat in the condensed milk and cooled chocolate until smooth. Spread evenly into the biscuit case. Cover with cling film and chill for at least 4 hours, until firm. Remove the pie from the springform tin, discarding the paper, and sit it on a baking tray. 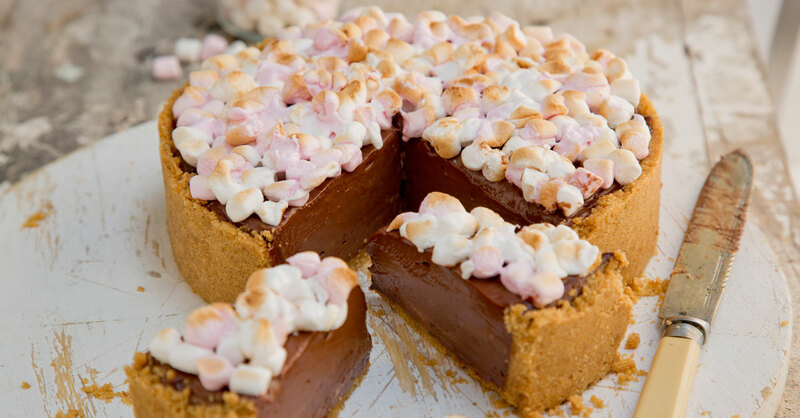 Arrange the marshmallows on top of the pie in an even layer. Place under the grill to melt and toast the marshmallows, keeping a close eye on them as they could easily burn. This should only take about 30 seconds or so. Remove and squish the marshmallows slightly with the back of a spoon to help them ooze. Sit the pie on a serving board or plate or a cake stand. Cut into wedges and serve. This will keep for a few days covered in the fridge.